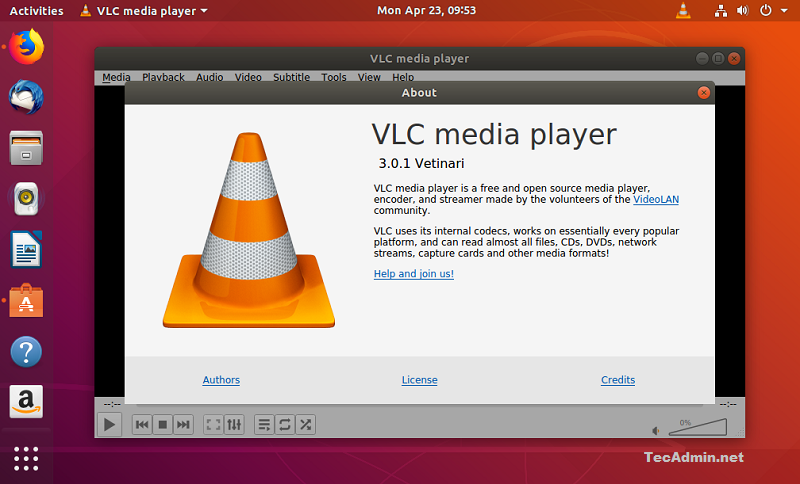 VLC is the most popular media player for Linux-based systems as well as for windows. VLC is a free and open source cross-platform multimedia player and framework that plays most multimedia files as well as DVD, Audio CD, VCD, and various streaming protocols. You must have root or sudo privileged user with Desktop access. Login to your Ubuntu Desktop and upgrade the current packages to latest version. The default Apt repositories and the VLC PPA contains the 2.X version for installation. But still, you can install VLC 3.x from snap packages. To start VLC player use GUI icon or use the following command to start it and enjoy audio/videos. You can find VLC version in About section under help menu. Congratulation’s! you have successfully installed the VLC media player on Ubuntu. Still doesn’t work. It tries to engage the dvd, but does not play….just spins. Its asking for password. I couldn’t type the password to do further. I found this mini tutorial very helpful. I also installed vic Ubuntu 16.05. But while i was installing libavcodec-extra-53 using the code, it was showing file doesn’t exist. How come files does not exist?